A loyal reader sent me an email this afternoon with an important miles question. This reader was sitting on 44,000 U.S. Airways miles, but had no use for them now that he flew United Airlines exclusively. What could he do? He wondered if there was a way to transfer the miles to his preferred programs (United Airlines or Starwood Preferred Guest hotel program). He also casually mentioned that he had seen sites where you could transfer points to your preferred program. Where Did All My Miles Go? U.S. Airways is actually part of the Star Alliance with United and other great carriers like Air Canada, Asiana, Lufthansa, and Thai Airways. 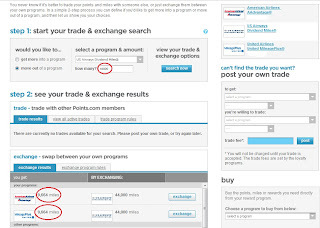 Having U.S. Airways miles means having the flexibility to use them on this versatile network of airlines, award space permitting. 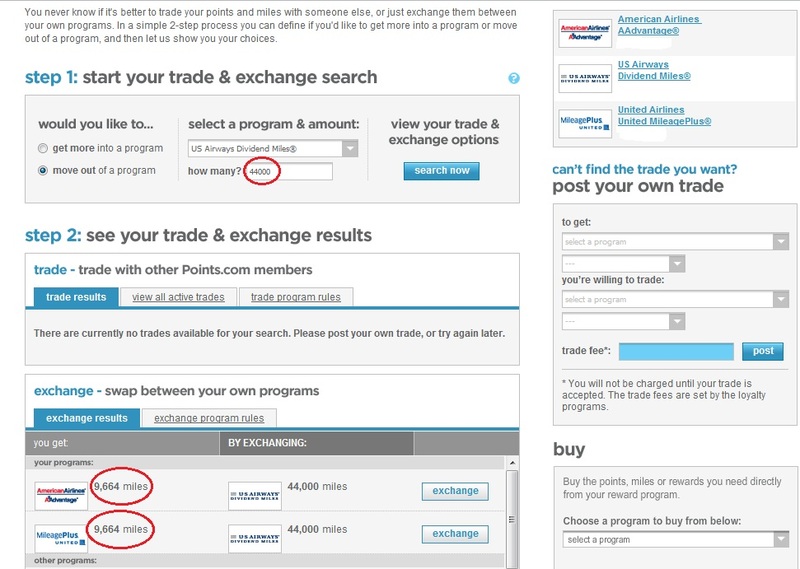 You can actually call U.S. Airways directly and book a United award ticket. Caveats? You should probably investigate availability on United's web site first, and then call in. Also be warned about the, ahem, quality of U.S. Airways agents. They often aren't aware of these partner bookings, so sometimes calls can be an exercise in frustration. I am always happy to navigate these tricky calls for anyone who doesn't want to deal with that stress. Just drop me an email. U.S. has a solid route network with major hubs in Philadelphia, Charlotte, and Phoenix. In checking out their award chart, there are some really fantastic values. Probably the best value proposition is their "off-peak" awards. U.S. Air offers discounted award tickets during the slow winter travel months in an effort to drum up business and fill normally unoccupied seats. As you can see from the chart below, the reader's 44,000 mile cache is more than enough to get him to Hawaii or even Europe for a mere 35,000 miles in coach. 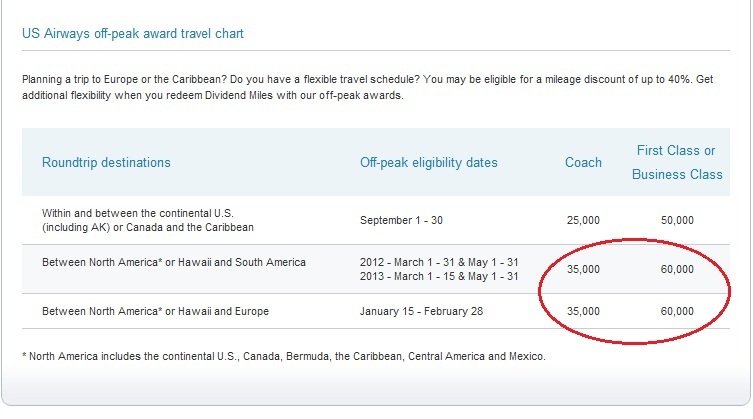 No other North American carrier offers deals like that! If the off-peak periods work for him (mid-January/February for Europe, March/May for Hawaii), he needs to jump on that ASAP. Look At Those Incredible Values! 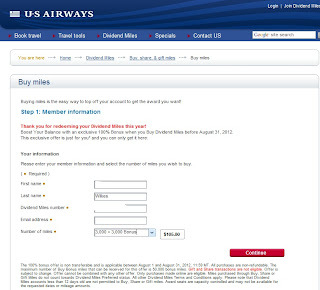 I don't normally advocate buying miles as airlines price them quite high, but in this case, it makes sense. The reader is only 6,000 miles away from a roundtrip business class ticket anywhere in the United States. 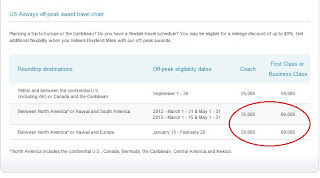 If he pays for these miles, he will be ready to book a great trip in a premium cabin. 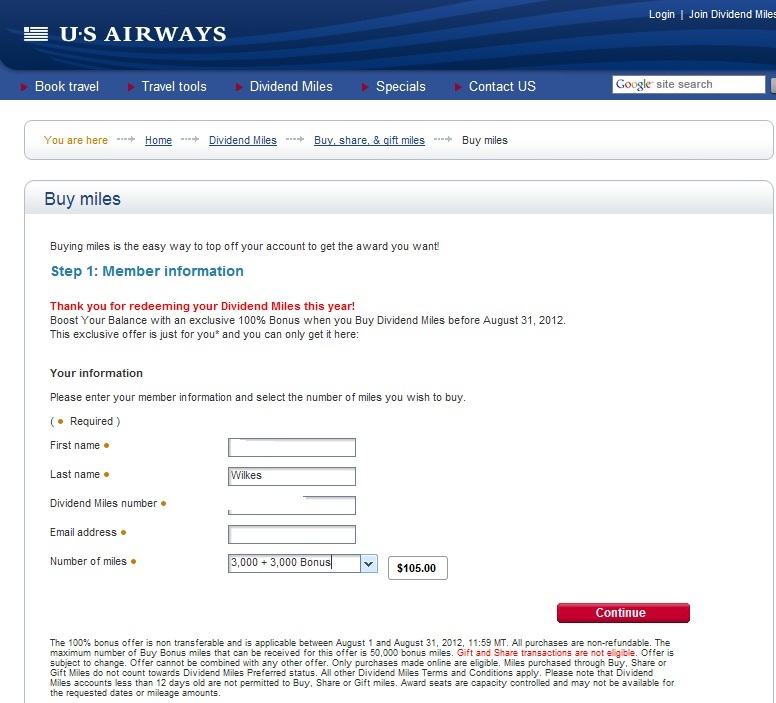 Luckily, U.S. Airways is running a bonus promotion right now where customers who purchase miles receive a 100% bonus on all miles purchased. Buying the 6,000 miles he needs will cost $105. Normally this sounds steep for "only" 6,000 miles, but my friend is really paying $105 to obtain a business class ticket. Wouldn't you do the same? Questions? Thoughts? Issues with my math? Drop me a line or leave a comment. Until tomorrow!